This software will be delivered electronically, and can be installed on computers individually or from a server, up to the number of licenses purchased. Network connection is not required. TI-SmartViewTM Emulator Software for the TI- 30X/TI-34 MultiViewTM Calculators. 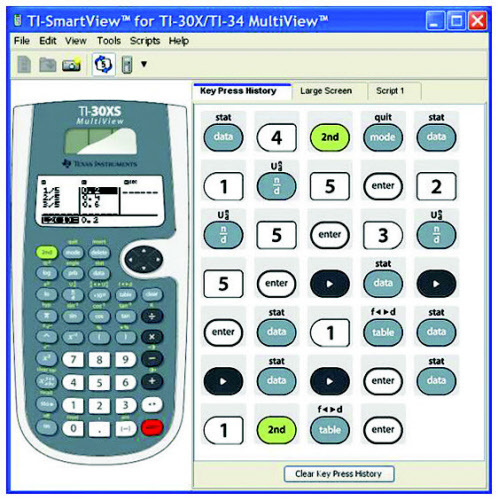 Designed to support the use of the TI-30XS MultiView and TI- 34 MultiView scientific calculators, TI-SmartView emulator software projects an interactive representation of the calculator and comes with unique instructional capabilities. Switch back and forth between the TI-30XS and TI-34 MultiView calculators to demonstrate different concepts and create powerful teaching moments. Helps increase student understanding of concepts by showing equation screens. (as recommended in the NCTM Standards). Increases teacher familiarity and comfort with graphing calculator functionality through preloaded demos (scripts) from TI. Provides a clear and easy way for students to follow along by displaying key press sequences. Easily integrates with existing projection systems and interactive whiteboards for viewing by the entire class.